Imam Abul-Hassan II, Ali ibn Mousa al-Rida, is the eighth in the series of the Imams from the Household of the Prophet in whose personalities all the standards of greatness have been personified; so, they became its most magnificent example and most genuine fountainhead. His life was characterized by a somber tragic stamp from its grievous beginning till its painful end. Bitterness seldom parted from his soul during the periods he lived, i.e. the reign of Harun al-Rashid and the beginning of the regime of al-Mamoon, the latter's son. At the outset of his life, he witnessed the norms of trials and tribulations which filled the life of his father Imam Mousa ibn Ja'fer (A.S.) , the patient Imam whose mere existence was the cause of worry for the ruling government and the source of its suspicious doubts despite his peaceful stance, distancing himself from any causes for a direct confrontation therewith. The Abbaside caliph al-Mehdi III ordered the Imam (A.S.) to go to Baghdad so that the caliph would secure from him promises and pledges that he would not oppose his authority or mobilize a revolution against him to put an end to his regime, and the Imam (A.S.) did not go back home till al-Mehdi joined his Lord and his shoulders bent by the load of the regime's sins and immoral actions to be succeeded by al-Hadi. 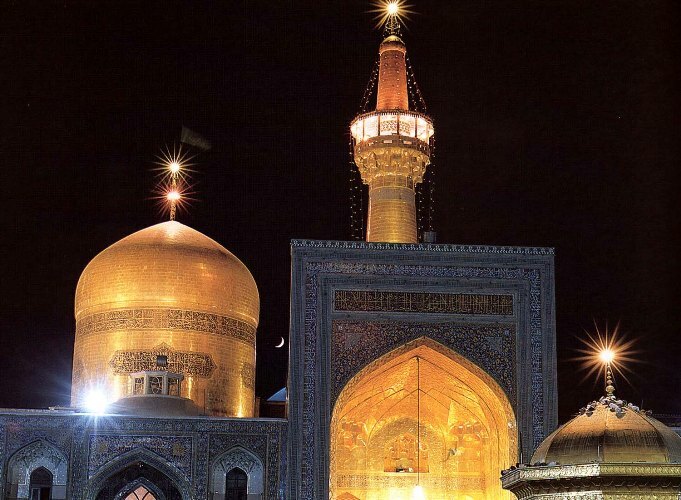 The latter tried to put an end to the life of the Imam, but he did not live long enough, so al-Rashid acceded to the throne, thus the parching flames of the tragedy started incinerating the existence of the Alawis headed by Imam Mousa ibn Ja'fer (A.S.), and the dungeons of Baghdad, Basrah, Wasit and other cities could not limit the regime's passion for seeking revenge against its opponents. Its antagonistic attitudes caused it to invent norms of revenge worse than what those dungeons could provide, such that humanity shudders from. Instructions issued by the government required the builders to fill the hollow building cylinders and columns with the still alive bodies of the elite among Alawi youths and non-Alawi sympathizers and to cause them to die thus out of suffocation. This ugly method of eliminating the government's opponents was not something invented by al-Rashid, but it was a continuation of a custom started by al-Mansour to seek revenge against some Alawi youths as history tells us. .
Imam Mousa ibn Ja'fer (A.S.) received the lion's share of the atrocities suffered by the Alawis during that period of time. Al-Rashid imprisoned him due to his being the top Alawi leader, subjecting him to extreme pressures at his horrible dungeons for fourteen years according to some accounts till he became tired of thinking of methods and means of inflicting pain on him; therefore, he ordered al-Sindi ibn Shahik, through his minister Yahya ibn Khalid, who was in charge of the last prison in which the Imam was imprisoned, to poison him and rid him of the presence of one who robbed him of his tranquility and peace of mind. Meanwhile, the Imam (A.S.) was painfully and bitterly watching closely the bloody events which consumed many of his own family and kin. He was destined to relive the tragedy through which his father had lived from its beginning to the end without being able to decrease its intensity, for he was powerless to do so. Maybe he even awaited the same fate at the hands of the ruling gang, for the dispute was one of a conflict of principles between the rulers on one hand and the Alawis on the other; it was not a personality conflict. After the martyrdom of his father and the perishing of al-Rashid, then the ending of the days of al-Amin in the way they ended, and al-Mamoon receiving the reins of government, the winds of yet another tragedy of a different type started blowing at the Imam (A.S.). It was a tragedy the Imam (A.S.) lived with extreme bitterness. Al-Mamoon, due to certain political reasons which we will discuss separately in this research, decided to use the Imam (A.S.) as a bargaining chip between him and the Abbasides in Baghdad on one hand, and between him and the Alawis on the other, and also between him and the Shi'as of Khurasan as well. The ploy of relinquishing the throne was foiled when the Imam (A.S.) refused to accede to it. Then he was forced to play a role in the masquerade of the succession to the throne. We are here concerned about dispelling some of the ambiguity which shrouded it, the ambiguity which dragged many researchers into a helter-skelter situation the results of which became obscured from their superficial sight the scope of which did not exceed the skimming of the surface, nor did they take the trouble to delve deeply into the depths of their research. It is worth mentioning here that when the Imam (A.S.) refused to accept the caliphate from the abdicating caliph, al-Mamoon, or to take charge of the post of heir to the throne, he had no reason except his own awareness of the real depth of the goal al-Mamoon anticipated to achieve by his plan, and that the desire to abdicate was not genuine enough to be taken seriously; rather, it was a political maneuver whereby al-Mamoon desired to perfect his game during a particular period of time, a game which was dictated by political circumstances posing serious threats to his seat of government. It was a situation on which the very destiny of al-Mamoon depended. The expected finale was thereafter enacted when al-Mamoon completed his acting part, which he had rehearsed beforehand, perfecting the playing of his intricate role in such dexterity and skill which secured a period of tranquility for his regime, something which he could not have otherwise achieved had he not done so, as we will discuss later in this research.